Having crossed both Lucques and A.O.C. 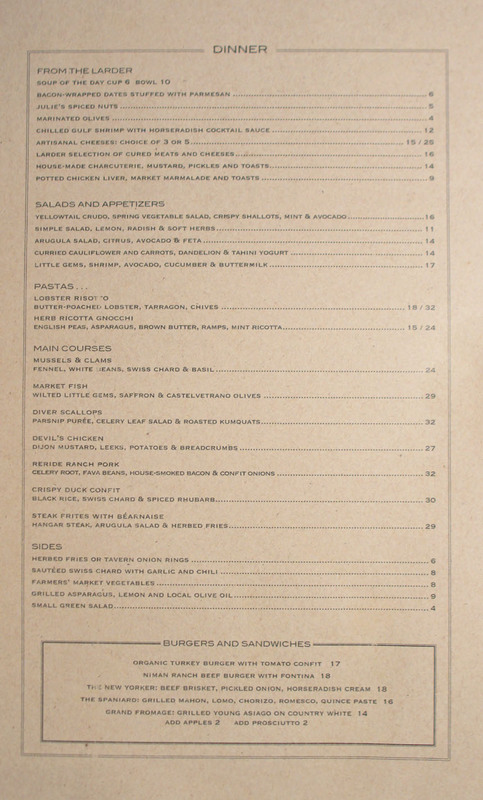 (both the new and old incarnations) off my dining bucket list, I figured that it was time to give Suzanne Goin and Caroline Styne's most recent restaurant, Tavern, a go. The fact that the place has a new chef in the form of Gavin Mills (whom I quite liked over at Wood & Vine) made my visit even more apropos. Tavern is comprised of three very distinct spaces. Up front is the Larder (not pictured), the retail component, while the center section houses the bar/lounge. Bringing up the rear is the glass-encased main dining room, properly called the Atrium and one of the most pleasing I've encountered in a while. 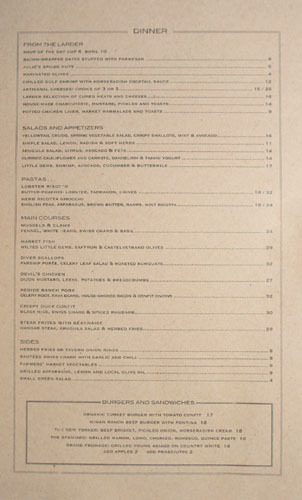 Tavern's menu reads Cal-Med-ish, reminding me a bit of Lucques' actually. 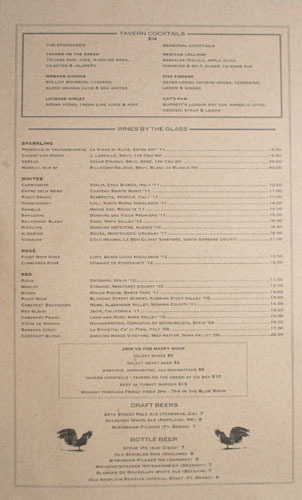 The wine program, curated by Styne, is expectedly commendable, with an appealing by-the-glass selection as well as a separate, much lengthier wine list, while cocktails make sense here, too. Click for larger versions. 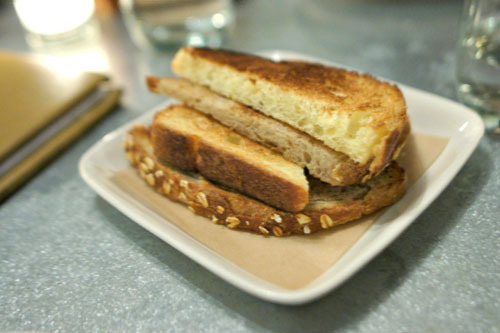 A prototypical example of bread and butter to begin. We commenced with a trio of cocktails. 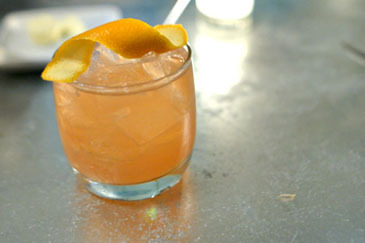 The Cat's Paw was quite fetching, and classic in essence, with a great mix of bittersweet and tart citrus nuances to play off of the gin--very nicely balanced. On the other hand, the Mexican Lollipop was much more in-your-face, with a bracing, sugary blast of lingering heat against persistent overtones of tamarind. 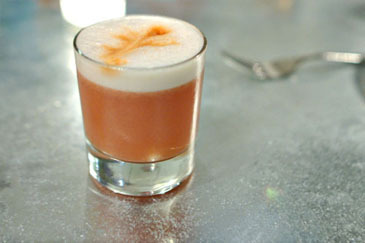 Last, we had the Howard Hughes, with its great, boozy base of Bourbon goodness blended with a multifaceted sweetness from the Luxardo and orange, all while the egg added a moderating element to the drink. 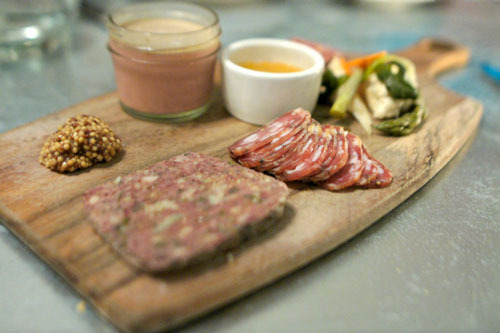 I was a big fan of Chef Mills' charcuterie program over at Wood & Vine, and I'm happy to report that he's continued that tradition here at Tavern. Both cold cuts were spot on, while the country pâté was even more enjoyable: properly coarse in consistency, with an intense, earthy savor to it, courtesy of the heart and spleen in there I'm sure. The table favorite, though, was the chicken liver mousse, which one of my dining companions declared as the best she'd ever had (she even took a jar home with her). I can see where she was coming from, as it was certainly one of the strongest preparations I'd eaten as well, showing off a refined, restrained, yet undeniably chicken-y flair that was fantastic over toast. Do yourself a favor and get the charcuterie if you come here. 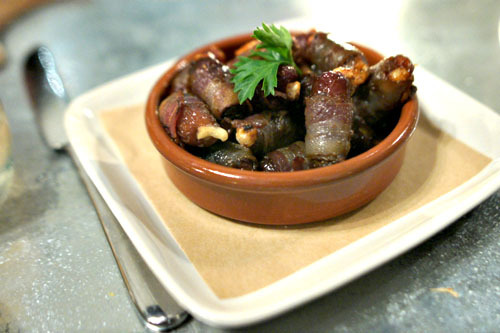 Bacon-wrapped dates were a classic example of devils on horseback, bouncing sweet and salty flavors off each other in expert fashion. Lovely crunch on the bacon, too. We then commenced with a parade of salads. 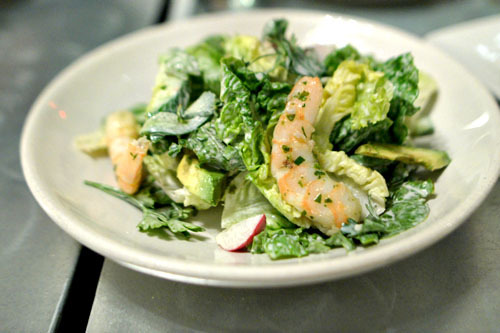 Little gem lettuce arrived crisp and succulent, with a refreshing character to it that worked well with the creamy weight of the buttermilk dressing, all while avocado added further depth to the dish. I would've liked a crisper, snappier texture on the shrimp, though. 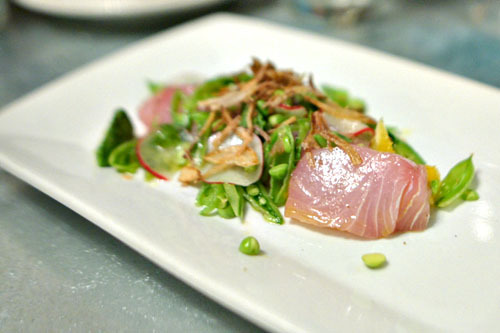 A crudo of yellowtail was quite to my liking, with the clean, glistening cuts of fish melding seamlessly with the savory topping of shallots, all while the various greenery on the plate offered up a countervailing levity. If that wasn't enough, I loved the mint here, which gave us a subtle, overarching brightness and bite to the dish that just clicked. The Simple Salad certainly lived up to its name. It wasn't particularly exciting, but worked well enough. 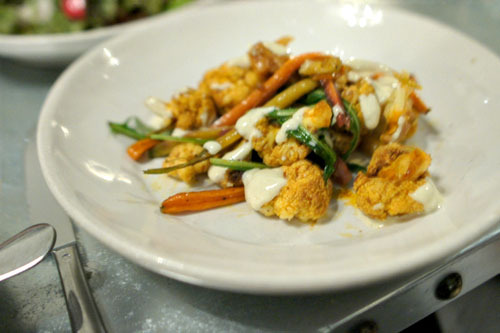 Cauliflower arrived imbued with the aromatic essence of curry, tempered by the drizzles of cool, creamy yogurt. Texturally, I would've liked it crisper, crunchier, though the carrots here did add a great textural component in the dish. Several of my dining companions seemed to really enjoy this salad. 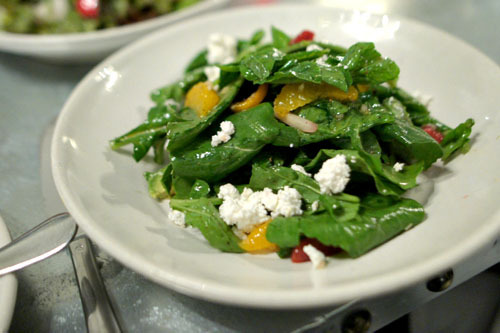 The flavors here weren't unexpected, but they were effective, with the bitter arugula working hand-in-hand with the tangy feta and tart, juicy citrus wedges. 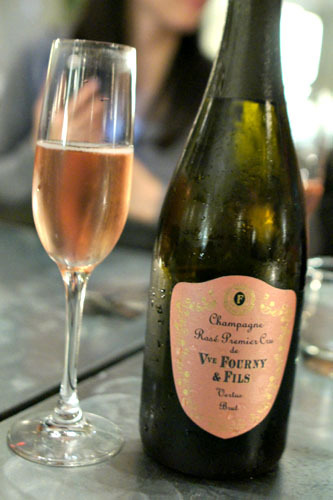 Moving on to wine now, we ordered up some bubbly in the form of the Vertus, Veuve Fourny, Brut Rosé, 1er Cru NV [$112]. This was an appealing sparkling rosé, on the dry, focused, mineral-y side, with a surprisingly subtle fruitiness to it and a marked undercurrent of toasty goodness. 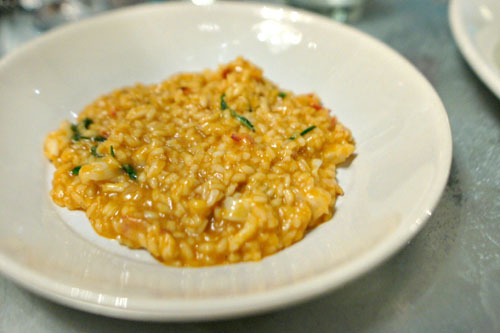 Getting in to the pastas, the lobster risotto arrived creamy and luxurious, with an almost bisque-like richness that showed off the sweetness and brine of the crustacean laudably, moderated by just a hint of herby contrast from the chives and tarragon. The gnocchi were even better, a superb presentation of the pasta in fact. 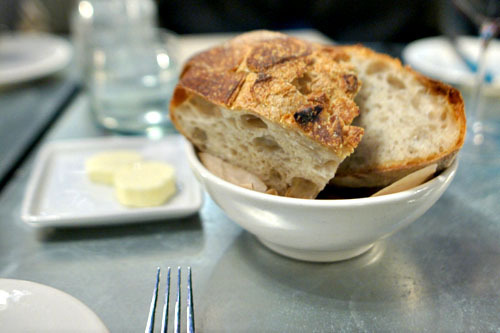 Texturally, they were on point--dense and pillow-y--with a mild savor that was amped up by the incorporation of brown butter into the mix. The key, though, were the veggies, which offset the weight of the dumplings beautifully, all while the mint served as the perfect accent piece to the dish. 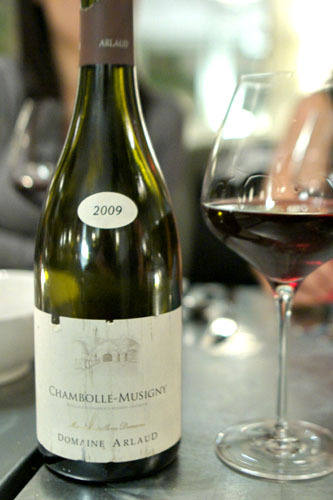 For the more substantial courses to follow, we went with a bottle of the Chambolle Musigny, Domaine Arlaud '09 [$154]. This one was light and tight, with plenty of tart fruity character bound with a bit of minerality and herbaceousness. Tasty, but it seemed a bit young overall. 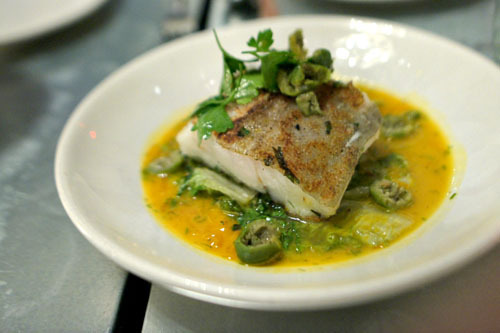 Now the mains: we began with the market fish, which was cod this evening. 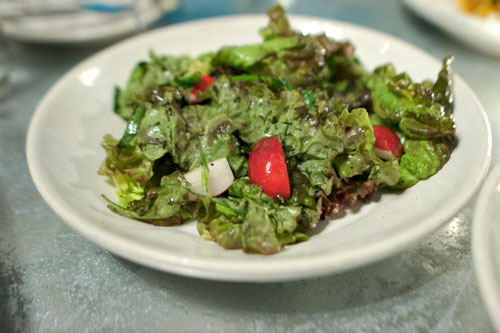 Just as expected, its flesh was flaky and moist, with a light, mild taste that just soaked up the piquant nuances from the saffron and olives, all while the lettuce added a well-placed crunchiness to the mix. Quite nice. Mussels and clams made for a delectably briny dish that paired the ocean-y flavors of the molluscs with the delightfully bitter aromatics from the chard and basil, all while the dish conveyed a tingling undercurrent of spice. 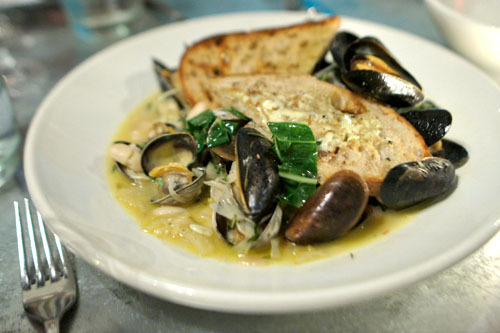 The beans were put to great use here, effectively tempering the course, and texturally, the clams were just about perfect, but the mussels were a touch gritty at times. 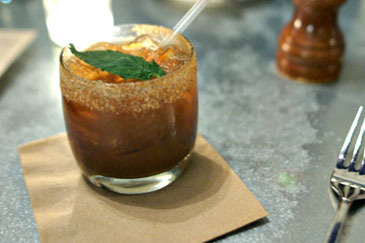 Next up was one of Tavern's most requested dishes, the Devil's Chicken, which, despite the name, isn't all that spicy. It did have a bit of peppery kick to it though, one that made sense with the flavorful bird. 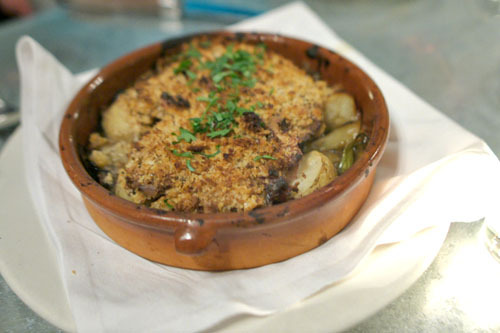 I really enjoyed the texture imparted by the breadcrumbs here, and the potatoes really formed a great base to the dish. My only concern was that in some bites, the all-important mustard seemed too overt at times, taking my attention away from the chicken itself. 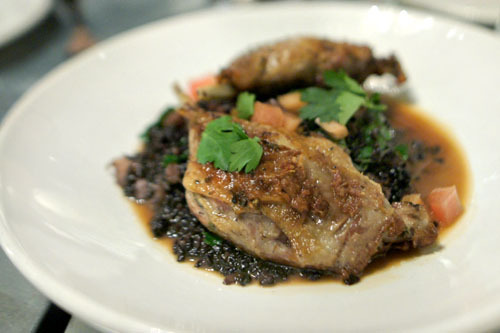 I'm a sucker for duck confit, and tonight the dish did not disappoint. It was a pretty much flawless presentation of the classic, with the immensely savory, succulent duck meat working beautifully alongside that crisp, salty skin. The bitter greens did a nice job moderating the course, and the inclusion of black rice was much appreciated as well. Delish. 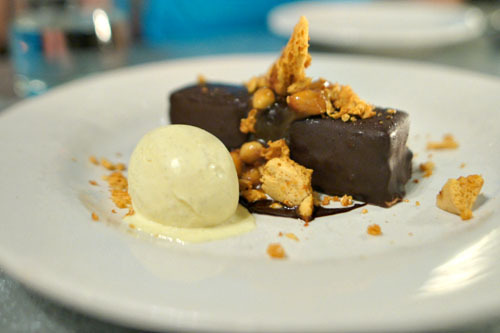 With the savories out of the way, it was time for Pastry Chef Christina Olufson's desserts, and what better way to start than with Tavern's signature "Snickers" Bar? It really was something special, deftly recalling the characteristics of the candy bar with its mouth-watering blend of nutty, salty, and sweet flavors, all set off by that vanilla ice cream. 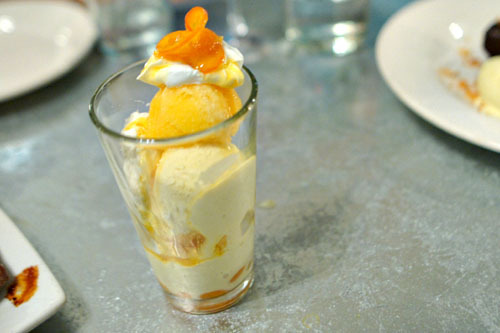 Speaking of childhood favorites, the creamsicle coupe did an even better job of capturing the essence of the original, perfectly balancing the lushness of the ice cream with the tart, tangy taste of citrus. Yum. 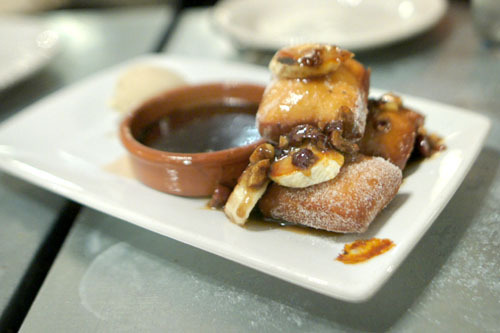 Last up were beignets, fluffy little pillows of sweet, spicy goodness that were particularly enjoyable when taken with a dab of that banana ice cream. 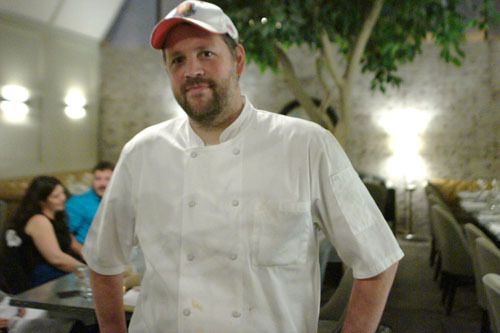 Chef de Cuisine Gavin Mills: now trimmer, more hirsute. Chef Mills seems to be off to a fine start here, and the food at Tavern actually reminded me quite a bit of that at Lucques, which I suppose isn't terribly surprising given their common lineage. 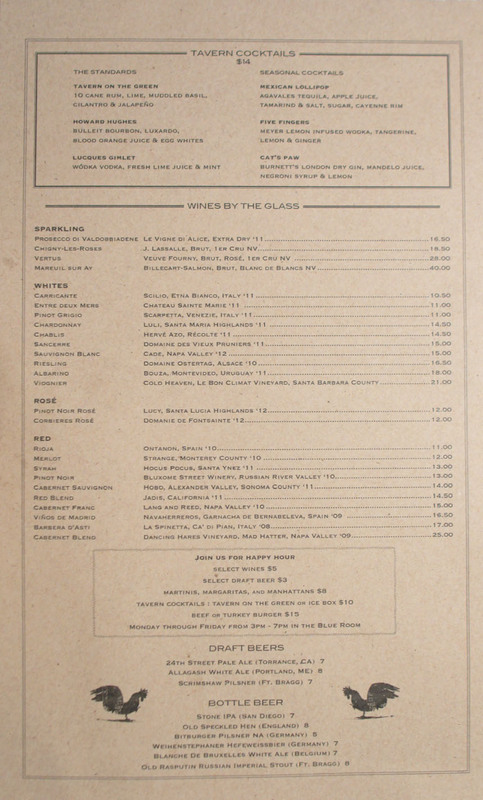 The cooking slants comforting, cozy, classic--straightforward, unfussy presentations that don't intend to wow or challenge diners but rather to satisfying them with a blend of rusticity and refinement. As such, Tavern doesn't exactly try to dance in the spotlight these days, but rather, seems content being exactly what it needs to be. two questions: do u believe that the meal was worth the price, and does the risotto have cheese in it? 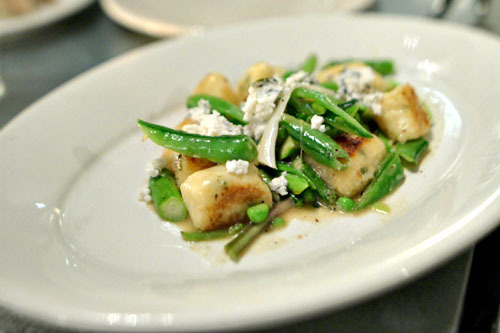 Were the gnocchi ricotta gnocchi or (potato) gnocchi topped with ricotta cheese? Do you eat every single plate or do you share with your dining companions? Dude: The meal wasn't particularly expensive, so yeah. And I don't recall any cheese in the risotto. sygyzy: I believe it was actually both. Andy: Have you been back recently? Gavin's already left. Anon: We share every plate. I couldn't possibly eat everything by myself.